Catch the Call Levels Team and our Co-founder Cynthia Siantar in this episode of Channel News Asia Money Mind – “Let’s Think About It”. Ahead of the 2017 Benzinga Fintech Awards, we’ve highlighted five companies that are “leveling the playing field” by making investing as easy for retail traders as it is for the top hedge funds in the world. Vote for Call Levels for helping to level the playing field and democratize investing for retail investors! 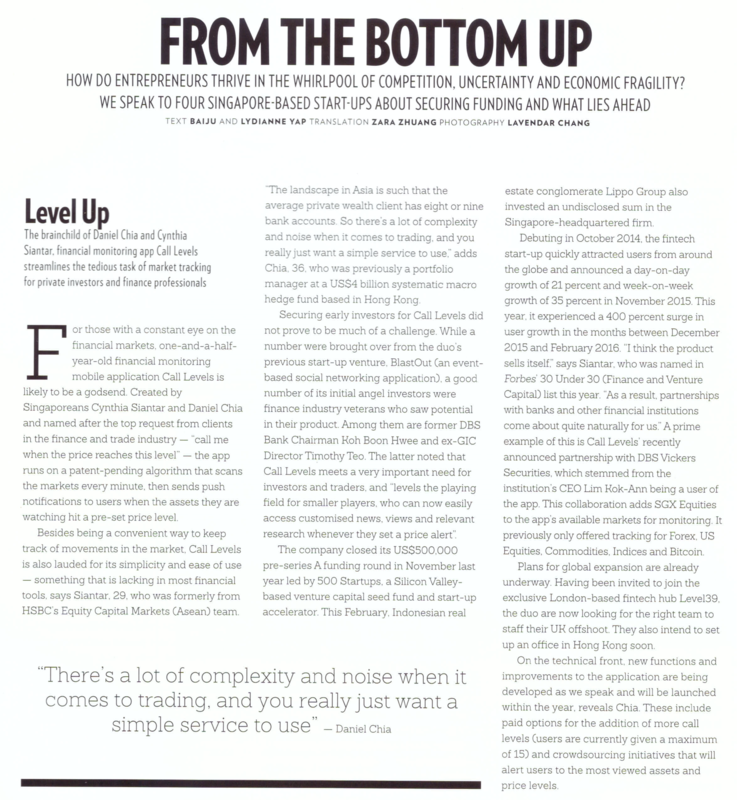 “Traditional Investment Made Different – Call Levels” In this article, Vulcan Post focuses on on Singapore-based fintech companies that will spearhead your wealth journey as a young investor. Call Levels is appPicker’s pick for one of the best apps to aid your forex trading strategy on-the-go! After a month of stringent selection from over 50 Fintech companies with private bank tech offerings in Asia, Call Levels is proud to be accorded the accolade of Asia’s Most Promising Fintech Startup in the Asian Private Banker Technology Awards 2016. A Dependable Pocket Assistant for Creating and Monitoring Your Financial Assets! Appliv reviews Call Levels for Android, with refreshed UI making it easier to use than ever! Asian female entrepreneurs are also claiming a place in the spotlight too, including Hooi Ling Tan, co-founder of Malaysia-based ride-hailing mobile service GrabTaxi, and Singapore-based Cynthia Siantar, co-founder of financial monitoring app Call Levels. Call Levels, a Singaporean fintech startup providing a cloud-based market monitoring and price alerts app, continues to see “exponential growth” as the company seeks to make financial services accessible to everyone and allow average investors to get accurate information and quick alerts right into his or her pocket. Leading Singapore Fintech Startup Call Levels has announced the appointment of Mr. Wong Joo Seng as their new Independent Director. Joo Seng brings with him a wealth of experience in growing start ups and in scaling businesses. Founded by Cynthia Siantar and Daniel Chia, Singapore-based Call Levels monitors live exchange data and provides free immediate price alerts to users globally, providing automated price notification calls for investors across portfolios of stocks, commodities, forex and indices, with users being able to share alerts with peers in order to extend tracking and monitoring. MAS recommends a mix of talent, funding and effective mentorship to create right ecosystem. Why not run a tech startup? “In the world of trading, when you make a profit someone else makes a loss”, mused Daniel Chia, 36, a financial professional who had been managing money for hedge funds and sovereign wealth for well over a decade. Daniel Chia and Cynthia Siantar left lucrative careers in the financial industry to build their start-up. Here’s why they think Call Levels is worth their while. After closing a seed round in November, Call Levels has announced a further capital injection from Indonesian Lippo Group.. These 3 Trading Themes Dominated 2015: What’s Big in 2016? Call Levels, a real-time financial monitoring and alert service designed to help traders monitor financial assets price movements easily on mobile, today announced that it has closed its pre-series A led by 500 Startups…. What are Singaporeans Looking At Outside of Equities? Wanna run a tech startup?